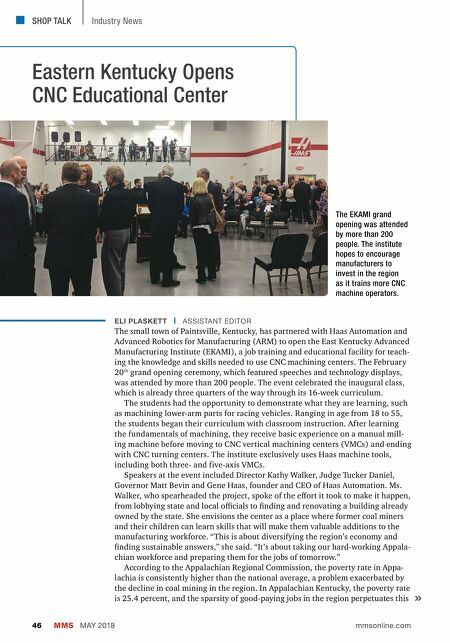 SHOP TALK MMS MAY 2018 46 mmsonline.com Industry News Eastern Kentucky Opens CNC Educational Center ELI PLASKETT | ASSISTANT EDITOR The small town of Paintsville, Kentucky, has partnered with Haas Automation and Advanced Robotics for Manufacturing (ARM) to open the East Kentucky Advanced Manufacturing Institute (EKAMI), a job training and educational facility for teach- ing the knowledge and skills needed to use CNC machining centers. The February 20 th grand opening ceremony, which featured speeches and technology displays, was attended by more than 200 people. The event celebrated the inaugural class, which is already three quarters of the way through its 16-week curriculum. The students had the opportunity to demonstrate what they are learning, such as machining lower-arm parts for racing vehicles. Ranging in age from 18 to 55, the students began their curriculum with classroom instruction. 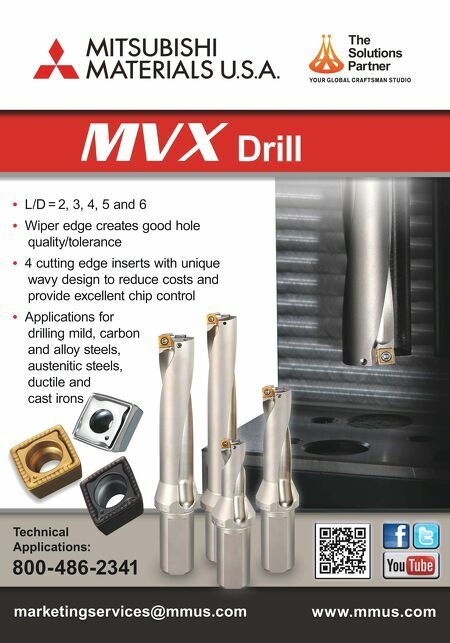 After learning the fundamentals of machining, they receive basic experience on a manual mill- ing machine before moving to CNC vertical machining centers (VMCs) and ending with CNC turning centers. The institute exclusively uses Haas machine tools, including both three- and five-axis VMCs. Speakers at the event included Director Kathy Walker, Judge Tucker Daniel, Governor Matt Bevin and Gene Haas, founder and CEO of Haas Automation. Ms. Walker, who spearheaded the project, spoke of the effort it took to make it happen, from lobbying state and local officials to finding and renovating a building already owned by the state. She envisions the center as a place where former coal miners and their children can learn skills that will make them valuable additions to the manufacturing workforce. "This is about diversifying the region's economy and finding sustainable answers," she said. "It's about taking our hard-working Appala- chian workforce and preparing them for the jobs of tomorrow." According to the Appalachian Regional Commission, the poverty rate in Appa- lachia is consistently higher than the national average, a problem exacerbated by the decline in coal mining in the region. In Appalachian Kentucky, the poverty rate is 25.4 percent, and the sparsity of good-paying jobs in the region perpetuates this The EKAMI grand opening was attended by more than 200 people. The institute hopes to encourage manufacturers to invest in the region as it trains more CNC machine operators.